Ever since Ewan McGregor and Charley Boorman used BMW GS motorcycles to tackle their epic journeys around the world the Adventure bike category has been selling strong. Brands as diverse as Royal Enfield to prestige marque MV Agusta have been getting in on the act but the BMW remains the gold standard. However with the GS and other major challengers now coming with things like GPS, stability control, a quick-shifter and other technological wizardry it seems to be less adventure and more twee Sunday ride. So to get back to the gritty survival spirit, California’s Gasser Customs has built this Baja beast for the intrepid explorer. 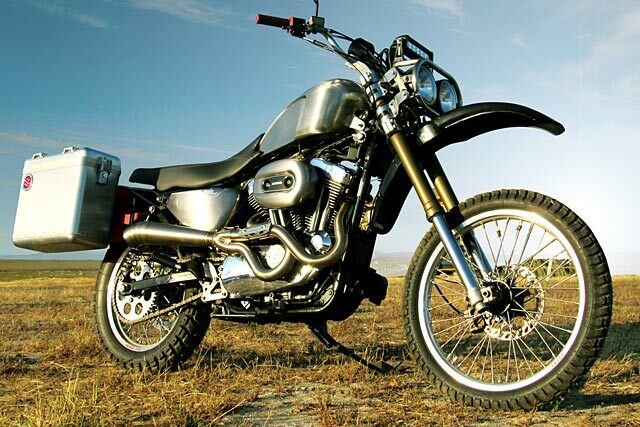 It’s a 2005 Harley Sportster 1200 that will take you anywhere, kick sand in the oppositions eyes and rightfully earns the name ‘Adventure’. 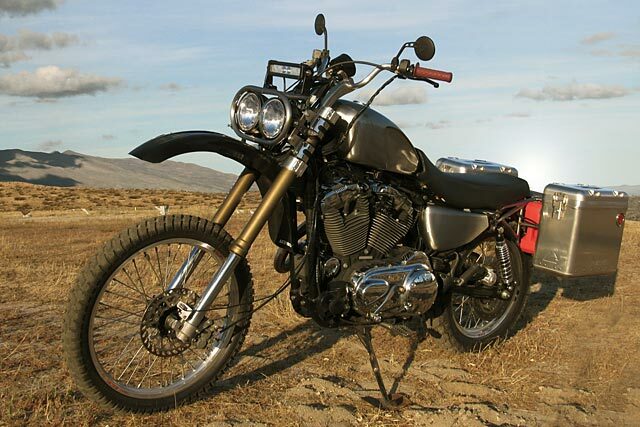 “The customer brought us the bike after seeing one of our other builds at the L.A Calendar motorcycle show. He wanted to create an American adventure bike that was specific to him and his needs,” explains the main man at Gasser, Adam Gaspic. 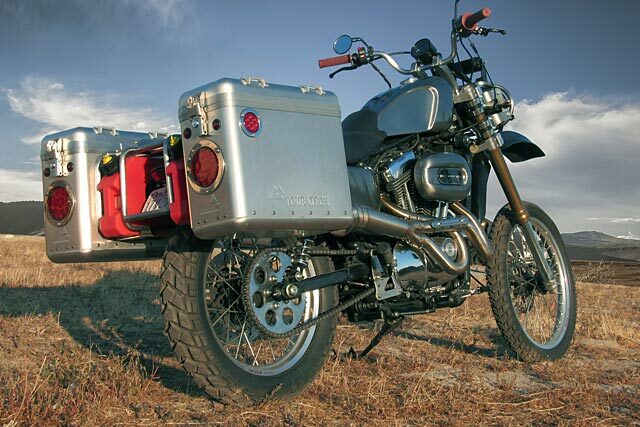 But it wasn’t just to be a Harley that looked as if it was the Milwaukee makers take on such a machine but a bike that could really handle weeks in the desert. By starting with a Harley the challenge was not just to create something totally unique but to do so without any off the shelf parts being available. That’s never been a problem for Gasser who are capable of making any custom part you care to name and always do it with perfect form and function. To get the Sporty sitting right and to give it both the clearance and suspension agility to handle much more than the stocker was ever designed for a full overhaul was needed. A set of modern dirt bike USD forks were selected for their ability to work in all conditions and with the right specs for the job. But these would never fit using either their or the HD’s stock triple clamps. So Adam got to work designing a set that were made in-house, both top and bottom machined from billet aluminium for the ultimate in strength and lightweight. With a considerable front ride height change the rear needed to be brought up too while still maintaining enough rear weight transfer for traction. To get the job done a custom pair of Hagon shocks were selected with progressive rate springs for both high and low-speed handling. Reducing the unsprung weight was achieved by ditching the stock rims and replacing them with newly laced Excel items that wear the appropriate Heidenau Scout rubber. The look of the machine wasn’t to be ignored either and the first thing that catches your eye is the gorgeous custom fuel tank. The knee dents serve a practical purpose but the applied brushed metal finish really looks a treat. The same coating was applied to the side covers that gives the whole bike a much more purposeful appearance. With the client wanting to be able to ride two up in the sand and no replacement factory or aftermarket item available Adam had to think outside the box. The solution was found in a Yamaha TW 200 unit that’s been made to fit and neatly reupholstered. 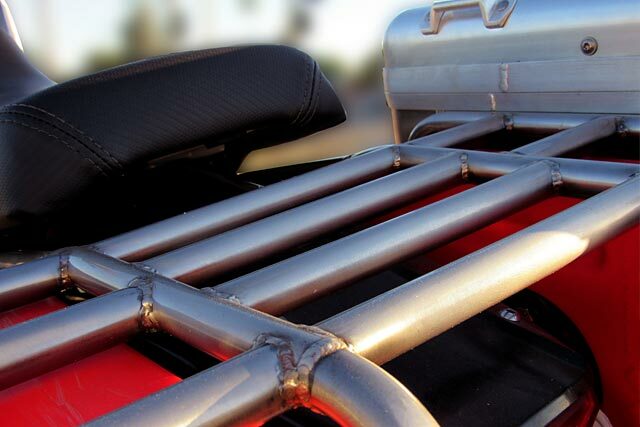 To create the part stainless tubing was used for its strength and durability in all conditions and neatly TIG welded together. 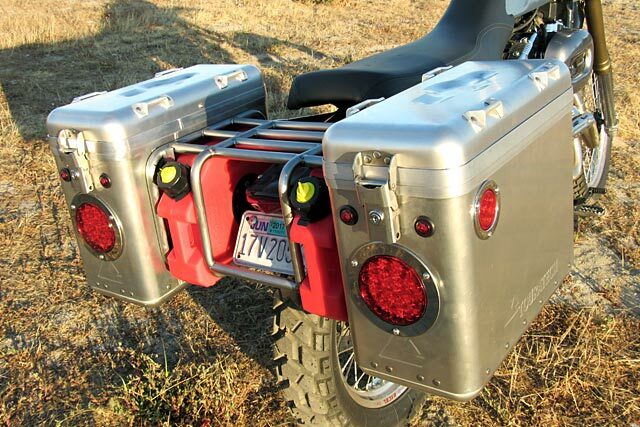 The unit allows for the incredibly neat mounting of the Touratech aluminium cases and the twin Rotopax fuel canisters. Always one to go the extra mile the locking mechanisms for the extra fuel units are mounted inside the boxes to ensure thieves can’t pinch your fuel from the camp site. With integrated taillights, side running lights and all the wiring hidden it is an amazingly neat addition and it’s hard to imagine anyone being able to execute the job better than this. Up front is no less impressive with a Baja racing inspired front lighting set up to make night-time sand hopping a breeze. 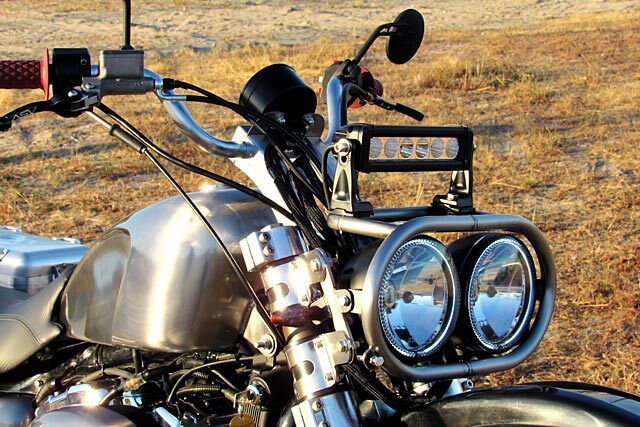 Twin headlights were installed and on top a purpose-built mount for the massively powerful 4000 lumen spot light. “The front lighting assembly was also challenging. It needed to house the twin headlights, turn signals and the spot light above them and somehow look proper in relation to the rest of the bike,” explains Adam about his desire to keep the theme of the bike running from front to back. 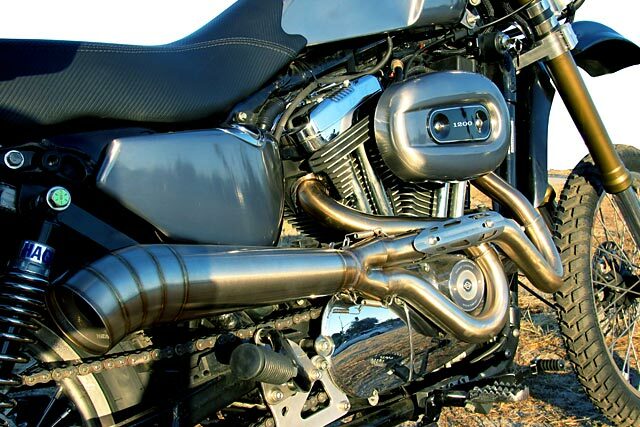 The engine hasn’t been left untouched either with matching stainless used to create a stunning 2 into 1 exhaust system. Not only does this unleash a glorious sound but along with tidying up the wiring system and a lick of paint gives the whole power unit that brand new feel. 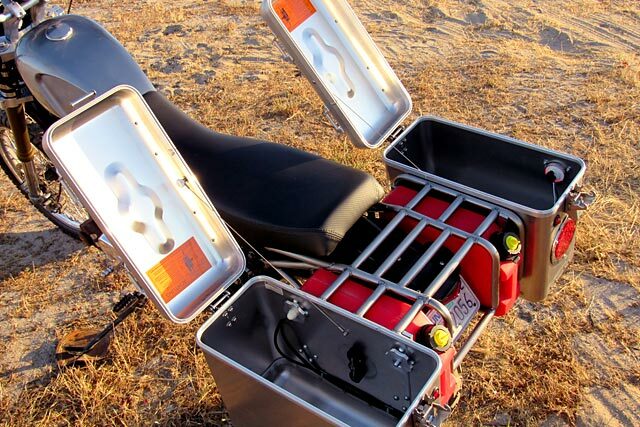 Applying the horses is a new throttle mechanism with the adventure style bars given new switch blocks and a set of motocross grips and levers. Bear trap foot pegs keep the rider’s boots in position no matter the conditions and a set of foldaway rubber items are fitted for the pillion. So how does she go? 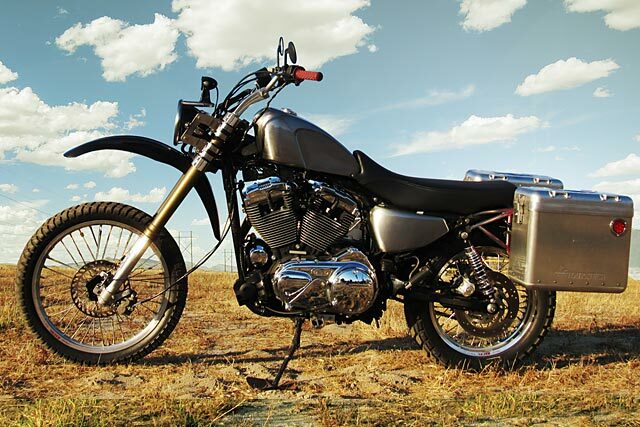 “My favourite thing about the bike is how it rides off-road. It doesn’t feel big and bulky at all, even though it is quite heavy. 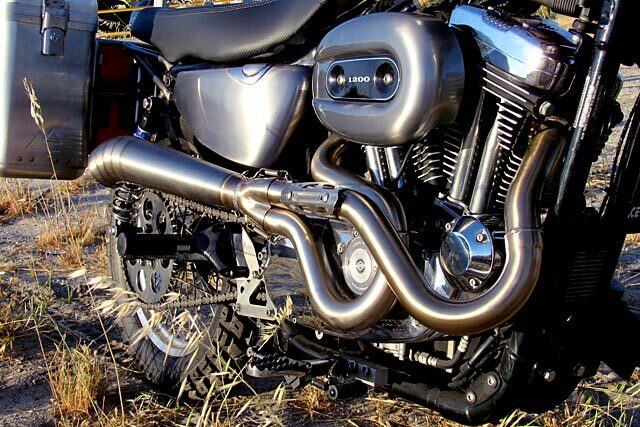 The big American v-twin torque down low just gives it the ability to effortlessly climb, and get you out of challenging situations,” enthuses a more than delighted Mr Gasser. Not only has he once again crafted a machine that is like nothing you’ve seen before, he’s met the challenge of producing a Harley Davidson capable of taking any man on his ultimate adventure and doing it with the sort of raw personality that is sadly being lost to the now space age adventure bike category.